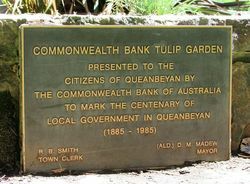 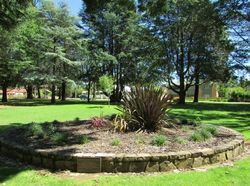 A rose garden was presented by the city auditors G. F. Thomas and J. D. Clayton and a tulip garden was presented by the Commonwealth Bank to mark the centenary of local government in Queanbeyan from 1885 to 1985. 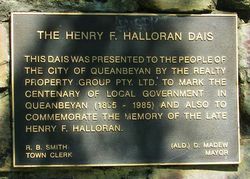 A dais was presented by the Realty Property Group Pty Ltd to also mark the centenary as well commemorating Henry Halloran. 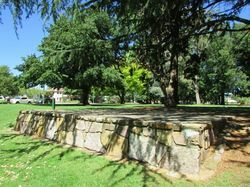 THIS DAIS WAS PRESENTED TO THE PEOPLE OF THE CITY OF QUEANBEYAN BY THE REALTY PROPERTY GROUP PTY. 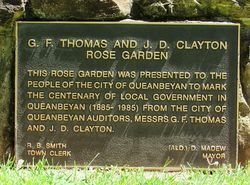 LTD. TO MARK THE CENTENARY OF LOCAL GOVERNMENT IN QUEANBEYAN (1885 - 1985) AND ALSO TO COMMEMORATE THE MEMORY OF THE LATE HENRY F. HALLORAN.